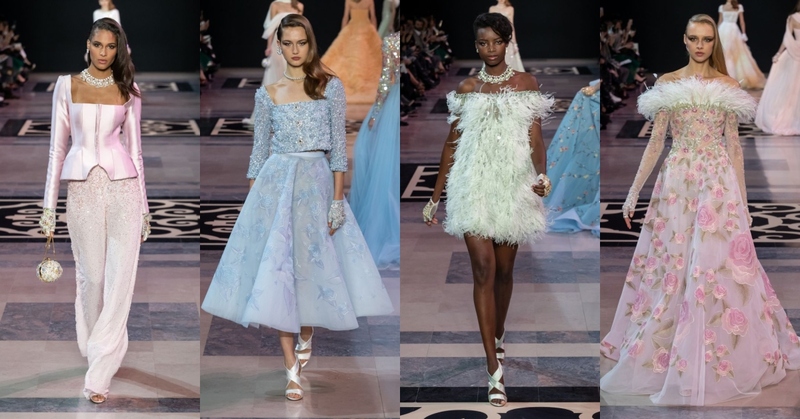 For his latest couture collection, Lebanese couturier Georges Hobeika’s revealed that his inspiration was the last Queen of France – Marie Antoinette, whose reign came to a halt during the French revolution. The couture show which held at Paris’ National Theatre of Chaillot was a runway filled with exquisite couture creations fit for a queen. The lavish essence of the royal’s residence, the style of the time, the palace of Versailles, reminiscent of the 18th century were captured in baroque embroidery and nostalgic silhouettes. This served as the beginning of the Lebanese designer’s newest offering. Georges Hobeika certainly knows a lot about luxe and royalty with a vast majority of his clientele made up of Arab Sheikhas and princesses. The style of the time mixed with today’s look had a result that could be seen in the beautiful and delicately embroidered evening wear filled with botanical patterns, tonal arabesques, regal silhouettes and feather detailing. For the show’s closing, a model bride walked out in a gown that was as regal as regal could be; a crystal-laden gown accentuated with a dazzling, floor-trailing veil that was almost unreal.